Overall, the Red Sox had a positive 2017 season. While it did not end with the ultimate goal of another World Series championship, and many of the young players took a step backward in their development, the team won one of the toughest divisions in baseball and were a fun team to watch night-in and night-out. Those are inarguably good things, but they are in the past. The 2017 season is done, at least for the Red Sox, so now we can get to the fun of looking to and generating expectations for the 2018 season. Yesterday, Cam Ellis highlighted five guys who he thinks need to have bounce back seasons for the 2018 Red Sox to advance beyond ugly Division Series losses. Here, in a similar vein, I want to get a jump on highlighting a few questions that I think the answers to will tell us a lot about how the Red Sox will fare in 2018. Will Chris Sale and David Price combine for at least 60 starts? As you know, David Price spent most of the 2017 season working his way back-and-forth from an elbow-irritation. The injury limited him to just 11 starts, and in only seven of those did he throw more than five innings. Contrary to Price, Chris Sale was everything he was expected to be and more. He had an excellent, possible Cy-Young-worthy 2017, making 32 starts, of which at least 25 could be considered good outings. When healthy, these two are undoubtedly one of the best 1-2 rotation combinations in the game. Having them take the ball for more than a third of the team’s games is ideal. It means several important things, notably: (1) fewer starts being made by Triple-A/Quad-A guys (e.g., Hector Velasquez, Kyle Kendrick – remember all the commotion about him early in the year? ), (2) easier days for the relief corps, as Price and Sale tend to provide six or more innings per outing, which means they are more likely to stay fresh throughout the season, and (3) the team can still win if a Price/Sale start coincides with a night in which the offense struggles, which will inevitably happen 20-30 nights per season. 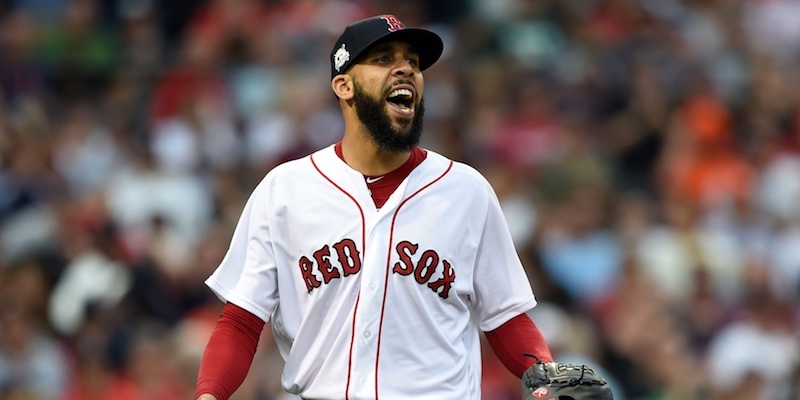 If Price and Sale can be Price and Sale, or at least close to it for 60 combined starts, the Red Sox will have a strong foundation from which they can work. Add another strong season from Drew “Big Smooth” Pomeranz, and have 2016 Cy Young Award winner Rick Porcello regain his Red Sox even-year mojo and you can see how the run prevention side of the team will continue to be a strength. Will the offense hit over 185 home runs? In 2017 the Red Sox won in spite of their offense, not because of it. This season, the team turned into a banjo-hitting outfit, who made a lot of contact but not much powerful contact. They had the third-lowest Isolated Power mark in the game. Their team total of 168 home runs was the fourth-lowest total in baseball. Their 11.0 HR/FB ratio was the second-worst. That string of ugly numbers is reminiscent of the lost seasons in 2014 and 2015. There are a number of ways the offense, and specifically the power supply of the offense, can change for the better; health being the foremost. The status of Mookie Betts’ wrist, Xander Bogaerts’ hands/wrist, Hanley Ramirez’s newly repaired front shoulder, and Dustin Pedroia’s knee (if he plays next year) are all important. A full season of Rafael Devers at third base will almost certainly be better than the Marrero-Rutledge-Sandoval-Lin-Hernandez-Selsky law firm that nobody wants representing them. And then there is the big ticket offseason question: will Dave Dombrowski make a bold move for a middle-of-the-order slugger? Probably, yes. He has shown repeatedly demonstrated that he is a guy who writes out a list of wants and then goes about crossing those things off. Slugger has to be on his list. But who? J.D. Martinez? Or maybe Carlos Santana? How about Eric Hosmer? The Red Sox would love to land either Giancarlo Stanton or Joey Votto, but at what cost? Salary only? Young, cost-controllable talent (not Andrew Benintendi, please!)? Regardless, the addition of a power hitter, improved health from a number of players, and some positive regression should have the offense back to an above-average level of performance. Something in the range of the late 2000s teams would be great. Will the _____________ era be one characterized by sustained player development and forward thinking? It seems like a foregone conclusion that Alex Cora’s name will fill the blank in that question. I remain surprised at how convinced people are that he will be an excellent manager, despite the complete lack of evidence. As I mentioned last week, I am not at all meaning to suggest that Cora will be a bad manager, rather I am saying that none of us have any idea of how well he will do. With that said, I will grant that Cora does seem like a better option than the other candidates that have been floating around for interviews. Regardless of my thoughts on other people’s thoughts on managerial candidates, John Farrell’s time in Boston is done. Dombrowski was cagey as all get out about the firing, perhaps implying that Farrell’s termination seems to have been at least partly due to the underperformance of many of the team’s younger players. With this in mind, the new guy will have to connect with and get the most out of the young core (i.e., Mookie, Xander, Devers, Benintendi, Jackie Bradley Jr.). From this perspective, Cora being a younger, ex-major league position player makes him a good fit. Managing in Boston is notoriously difficult. After Farrell was fired, much beloved ex-Red Sox manager Terry Francona recently noted “…that place is a little crazy.” So whoever gets hired has that to look forward to. Hopefully he can handle it, and guide the ship to another division crown. All told, there are plenty of reasons to expect the Red Sox to be better in 2018 than they were in 2017. They may not win 100 games and run away with the division, but they are absolutely built to be in contention. If they get 63 combined starts from Sale and Price, hit 192 home runs, and have a manager who consistently puts the players in advantageous situations, it is hard to imagine them not fighting for top spot in the division and another playoff berth. Sure, the Yankees are terrifying. and I acknowledge my outlook has something of a rosy hue to it. But with that standing, a few tweaks – most notably in the form of a quality bat – and the Red Sox will be expected to be really good. Maybe even capable of winning a playoff series or two, and if they’re feeling like champions, a third wouldn’t be bad at all. If I were interviewing Alex Cora for the job, I would ask him whether he would have pitched to Aaron Judge in the 8th inning of ALCS Game 4. That seemed to me to be a big mistake by Hinch, with Ellsbury on 3rd and 1st/2nd open and Judge already having hit a HR. I think pitching to Judge in that situation is fine. Getting a strikeout is critical. Judge strikes out a lot (especially against high-velocity fastballs). Giles strikes a lot of people out (and throws hard).